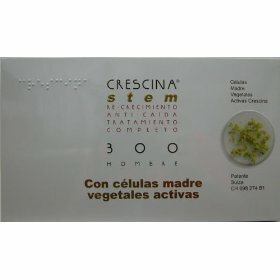 Crescina Stem vials: For topical cosmetic use, helps intensify the natural growth of hair. 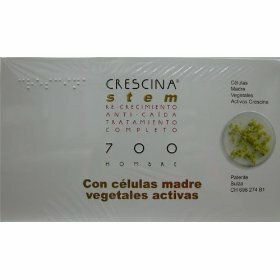 The core ingredient of Crescina Re-Growth is a combination of two amino acids, Cysteine and Lysine, which are basic components of hair keratin, and a special growth factor called Glycoprotein, which is able to promote cell activity (in vitro test) in the bulb cell to stimulate protein synthesis, especially of keratin, which is the basic protein found in hair, associated to Diguanosine TP, Prolifex and Isofol. The formula is enriched with Polyphitic Factor, indicated in cases of incipient baldness. Crescina is a product available in vials for external cosmetic use. It will have no effect on totally atrophied hair follicles. 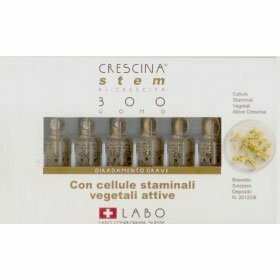 Active Plant Stem cells: The 3 ml flask contains the mix of Active Plant Stem cells 500, composed by Malus domestica and Buddleja davidii + Teprenone (swiss patent). Take 0.5 ml with the dosifier and add them to each Crescina Stem vial before application. it contributes to help the natural growth of hair. Crescina Anti-Hairloss Plus-Serious Hairloss: Crescina Anti-Hairloss Plus with Taurine is an intensive anti-hairloss treatment. Recommended period of application for Crescina products in vials is two months. Vials are applied on alternate days, on clean dry scalp, gently massaging lotion so it penetrates. 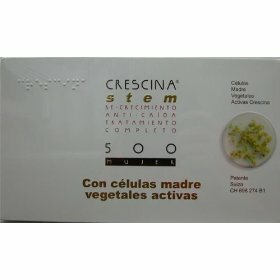 With Active Plant Stem cells.